August is Community Month at the Arcades Shopping Centre in Ashton. Lots of charities and community groups have been there with plenty of volunteers represented including the Tameside branch of the RSPCA, which is entirely run by volunteers, and Christine from Dukinfield Moravian Church who volunteers to make up hampers for families in need. I joined Active Tameside there on Thursday. I am nearing the end of my volunteering challenge and one thing I wanted to try was to be a mascot. I had many offers and even made it onto a football pitch with Stalybridge Celtic but no costume yet. Finally my opportunity came. My brief was to become Elegant Ella for the day and encourage the people of Tameside to get more active. At first I thought Ella was going to be an elephant and this raised the question, why had they chosen me as an elephant? It turned out that she was a gymnastic in flesh coloured tights and that raised the question, why have they chosen me to be a gymnast and why flesh coloured tights? I don’t think it was odd to assume that Ella was an elephant. When I first heard about the Wally Walrus sessions at Active Hyde I just thought it was a name for the under five swim sessions like little ducklings. What I hadn’t predicted was a six-foot, fluffy Walrus doing heads, shoulders, knees and toes at the side of the pool to the delight of many toddlers. I got into my costume at Active Ashton; tights, shorts with braces, top, massive shoes and an even bigger head. Anna from Active Tameside told me that someone earlier in the day had found it so hot in the costume that they had only lasted 10 minutes. As soon as the head was on I could see why. My hair became flattened to my face and the temperature went up 200 degrees. We chose to walk to the shopping centre in my regular shoes. The only problem was that my eyes were at Ella’s nose height. I could see the sky through the eyes and the floor through the mouth but even that took a while to work out. Anna led me across the bus station; I had to avoid prams, bikes and the dreaded curbs. “Curb,” Anna called as I heard a snigger from a passing bus. I raised my foot up and managed to avoid tripping. As we entered the shopping centre I veered left and nearly hit a wall. Safe in the Arcades Shopping Centre I put my big feet on. My job was to encourage people to take up a hoola hoop competition. I managed to put a hoop around my waist and then tried to spin it. It fell to the floor. I tried to spin it on my arm but didn’t realise the head was so big. It hit me in the face and then rolled off. Scared of being sued for a hoola hoop incident. I got into characters. What do mascots do? Well they don’t usually speak. That would give the game away. So I bobbed about and swayed. Waving was my next skill. This caught the eye of the under fives. Their enthusiastic mums wheeled them over. I offered a high five, which sometimes was met with a combination of embarrassment and fear. Despite my initial apprehension I soon got the hang of it, waving, thumbs up for good hoola hooping and I even worked out how to blow a kiss. Seeing the kids’ eyes light up as they saw me was amazing. They were delighted to meet me and to take away a balloon. One mum said, “I keep forgetting there is someone in that.” I posed for photograph after photograph as the sweat rolled down my back. It felt as if my hair was sweating at one point but I didn’t care as it was so much fun. It was time to go back to Active Tameside and I walked back in the big shoes. This made it even worse. As I left the shopping centre a group of teenaged boys walked past and I am sure I heard one of them shout, “Oi ginger.” Ella has the most beautiful fluffy red hair and she rose above the remark and tried not to stumble over her shoes. I alarmed one woman as she walked in because she wasn’t expecting to see a massive headed gymnast wandering out of the shopping centre. 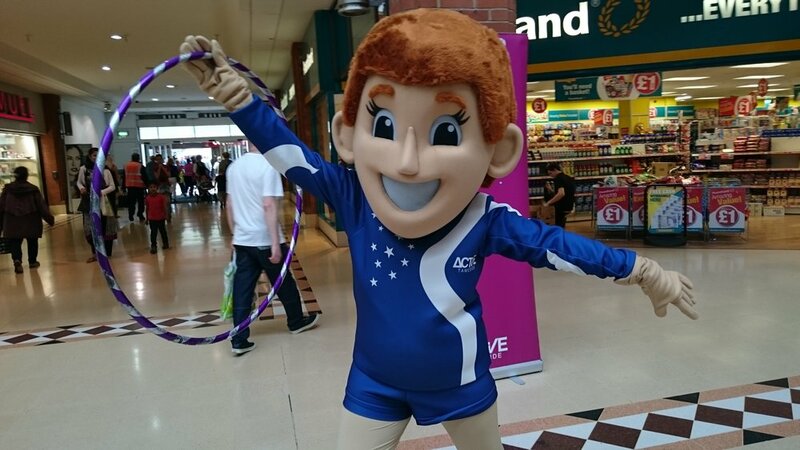 My job was complete and if you got a picture of a gymnast with a big head on Thursday at the Arcades Shopping Centre then that was me, nice to meet you.